Spicy Pickle Franchising, Inc. is offering franchises for the operation of fast casual restaurants featuring culinary inspired panini, salads, submarine style sandwiches, Neapolitan thin crust pizza, along with soups, sides, chips, soft drinks and our signature pickle. In addition, franchisees pay us our out-of-pocket costs to assisUn_theilestanmnt_huiJd-out. Customers can also create made-to-order sandwiches featuring proprietary condiments and a large and unusual variety of toppings. The initial franchise fee for a SPICY PICKLE franchise is $Zb$Q&25JMt We also offer qualified persons the right to develop multiple SPICY PICKLE Restaurants within a specific geographic area under a Development Agreement. If you execute a Development Agreement you pay $10,000 towards each additional SPICY PICKLE Restaurant to be developed in addition to payment of the initial franchise fee for the first franchise. The total initial franchise fee fQr_tlie_s_e_QQjid_and subsequent Restaurants developed under aJu>ey_eiQpment Agreement,isjiisc_p_unled to $20.000 per Restaurant. The total estimated initial investment, including the initial franchise fee and Build Out Program cost^apoLpiic 0-iitrO_:nO-C_ket costs to assist YouJn_theJaiild-out of vouLRestauranl. for the purchase of q singlothe first franchise ranges from $294^00383.680 to $347.000t402.880. 1. THE FRANCHISE AGREEMENT PERMITS YOU TO SUE US ONLY IN COLORADO. OUT OF STATE LITIGATION MAY FORCE YOU TO ACCEPT A LESS FAVORABLE SETTLEMENT. IT MAY ALSO COST MORE TO LITIGATE WITH US IN COLORADO THAN IN YOUR HOME STATE. .THERE MAY BE OTHER RISKS CONCERNING THIS FRANCHISE. ring CircularJnJtie^tates with franchise registration laws are in Exhibit J. The name of the franchisor is Spicy Pickle Franchising, Inc. For ease of reference, Spicy Pickle Franchising, Inc. will be referred to as "we", "us" or "SPF" in this Offering Circular. We will refer to the person who buys the franchise as "you" throughout this Offering Circular. If the franchisee is a corporation, partnership or limited liability company, certain provisions of the Franchise Agreement will also apply to the owners and will be noted. Our principal offices are located at 90 Madison Street, Suite 700, Denver, Colorado 80206. We presently do business only under our corporate name. We were formed on January 14, 2003 as a Colorado limited liability company and on September 8, 2006, we converted to a Colorado corporation. Our agents for service of process are listed on Exhibit A.
Spicy Pickle, LLC ("SPL"), a Colorado limited liability company formed on March 8, 1999, may be considered our predecessor. As of the date of this Offering Circular,j#e have no affiliates. We reserve the right to create an affiliate company that will sell breaxLtoJranchisees in Colorado. SPL. through its founders Kevin Morrison and Tony Walker, created the SPICY PICKLE Restaurant concept and until January 1, 2005, its primary business was operating SPICY PICKLE Restaurants. Between November of 2004 and January of 2005, SPL sold its three original SPICY PICKLE Restaurants, two to franchisees, and one to us for operation as a company restaurant..
We currently offer franchises for the operation of friendly neighborhood, fast casual restaurants featuring culinary inspired panini, salads, submarine style sandwiches, Neapolitan thin crust pizza known as Pizzetti, along with soups, sides, chips and soft drinks, and our signature pickle that is served with every sandwich and is available for purchase separately ("SPICY PICKLE Restaurants" or "Restaurants"). Customers can also create made-to-order sandwiches featuring proprietary condiments and a large and unusual variety of toppings. The Restaurants feature over 4^OOJjQ.Q.00Q varieties of custom sandwiches, prepared using top-quality ingredients. SPICY PICKLE Restaurants operate under our distinctive business format, systems, methods, procedures, designs, layouts and specifications ("Licensed Methods") and under our service mark "SPICY PICKLE" and related logos, trademarks, service marks and commercial symbols ("Marks"). Our Franchise Agreement ("Franchise Agreement"), attached as Exhibit B to this Offering Circular, is signed for each SPICY PICKLE franchise purchased. As a franchisee, you will receive the right to use our Marks and Licensed Methods to operate your SPICY PICKLE Restaurant, at a location approved by us ("Franchisetl Location"). A SPICY PICKLE Restaurant is typically located in a neighborhood or commercial shopping center or other suitable facility that we will approve before development of the facility. The Restaurants are usually less thanapproxjrnaiejy 1.600 to 2,000 square feet, in leased or owned restaurant space. The SPICY PICKLE Restaurants have a friendly, casual, urban decor, use a standardized menu board and provide counter-service for ordering. Featured combinations and made-to-order sandwiches are prepared using premium quality ingredients including its meats, cheeses and breads. The SPICY PICKLE Restaurants are customarily designed to seat approximately 30 to 50 people inside, with additional outdoor seating capability also recommended. conditions of the.Build-Out Program, we assist vou to develop, construct and eqmp^_al_YP_ur cost, vour SPICY PICKLE Restaurant. See Itejns_j.^Land_8. You must execute our Delivery and Catering Services Addendum to the Franchise Agreement ("Delivery and Catering Services Addendum"), which grants you the right to offer box lunch delivery and catering services for certain menu items in accordance with the terms of the Franchise Agreement, the Delivery and Catering Services Addendum and our standards and specifications. If you qualify, you may obtain from us the right to develop multiple SPICY PICKLE Restaurants within a designated geographic area under our Development Agreement ("Development Agreement"), which is attached as Exhibit C to this Offering Circular. The Development Agreement designates a "Development Area" reserved for your development of Restaurants. The Development Agreement states the number of SPICY PICKLE Restaurants and the schedule for your development of those Restaurants. A separate Franchise Agreement will be executed for each Restaurant developed under the Development Agreement.. The scope and term of any Development Agreement and the number of Restaurants to be developed is dependent on both your development plans and our determination, in our judgment, of your financial capability and qualifications to develop multiple operations within the Development Area. You must comply with all local, state and federal health and sanitation laws and regulations, food handler licensing requirements and, if applicable, all liquor licensing laws. You are responsible for complying with these applicable laws, rules and regulations, as well as with all local, state and federal laws of a more general nature, which affect the operation of your business. You should consult with your attorney on this subject, especially regarding state and local laws, rules and regulations that may affect the operation of your SPICY PICKLE Restaurant at your particular location. You are responsible for complying with employment, worker's compensation, insurance, corporate, taxing and licensing laws and similar laws and regulations. The market for restaurant services and, in particular, fast casual dining featuring sandwiches, pizza, salads and soups, is well established and highly competitive. The popularity of this market segment, however, has also significantly increased the competition.The restaurant business is highly competitive as to price, service and food quality. You will compete with,national as well as regional restaurant chains, operating under well known and recognizable service marks as well as with independent, sandwich and pizza shops and other businesses which offer similar types of food and beverages. You may even experience competition from other. SPICY PICKLE Restaurants outside of your Protected Territory and from SPF, as we may sell at wholesale SPICY PICKLE branded food specialty ingredients or products, through trade shows, Internet websites, mail order catalog or through grocery stores or other food specialty stores selling food for off-site premises consumption. We also operate SPICY PICKLE Restaurants and reserve the right to develop SPICY PICKLE Restaurant locations in certain non-traditional venues. See Item 12. We, in combination with certain of the principals in our company, have over s4*sjyjyi years experience in operating SPICY PICKLE Restaurants. From August 1999 until January 2005, through SPL, Tony Walker and Kevin Morrison operated thtee_SPICY PICKLE Restaurants all in the Denver, Colorado metropolitan area. 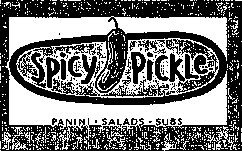 The original SPICY PICKLE Restaurant was opened by Tony Walker and Kevin Morrison in August, 1999, in Denver, Colorado, and was sold to a franchisee in November 2004. The second SPICY PICKLE Restaurant opened by them and operated through SPL was sold to a franchisee in January 2005. See Item 20. Since our purchase of one of SPL's original three Restaurants in January 2005, and-urttiLthat location closed at the end of the lease term in November, 2006T we have operated a restaurant of the type to be operated by you. We have offered franchises for SPICY PICKLE Restaurants since March 2003. Neither SPF nor SPL have offered franchises in any other lines of business. Mr. Geman has been our President, Chief Executive Officer and a Director since September 8, 2006. From January 2003 until our conversion to a corporation, he was a Manager and a Member of the Board of Managers of SPF. Mr. Geman was President of Bayview Technology Group, LLC ("BTG") from 2001 until its sale in 2003 to USA Technologies, Inc, ("USA"). He then served as a consultant to USA through 2004. Bayview and USA manufacture and distribute energy-saving devices for refrigerated cabinets. From 1995 to 1998, he was President of Pretzelmaker Holdings, Inc., a national franchisor of soft pretzel stores that was sold to Mrs. Fields Cookies, Inc. in November 1998. Mr. Geman was a founder and CEO of Portfolio Management Consultants, Inc., a licensed broker-dealer/investment advisory firm managing assets for high net worth individuals from 1990 to 1995. Since 1973, Mr. Geman has been a licensed attorney in the State courts of New York and Colorado, as well as the Supreme Court of the United States. Mr. Morrison has been our Chief Culinary Officer and a Director since September 8, 2006. From January 2003 until our conversion to a corporation, he was a Manager and a Member of the Board of Managers of SPF. He has also served osw_as_3 Co-Manager of SPL, a position that ho has held since co-founding the concept and oponinftwJiicJi_Qp.eQgd the first SPICY PICKLE Restaurant in 1999, in Denver, Colorado. He and his partner, Anthony Walker, developed the first three SPICY PICKLE Restaurants, the last of which was sold in January 2005. From 1995 until August 2000, Mr. Morrison owned and operated a wholesale food distribution business, Red Tomato Specialty Produce, in Denver, Colorado. Prior to that Mr. Morrison worked as a line cook and chef at Cafe Borgia and VimeiYinoi in Chicago, Illinois, at Angelo's in Aspen Colorado, and finally at the Barolo Grill in Denver, Colorado. Managers of SPF. Together with Mr. Morrison, he is was a Co-Manager of SPL, SPF's predecessor company that in August 1999 started operating SPICY PICKLE Restaurants in Denver, Colorado. The last of SPL's Restaurants was sold in January 2005. From 1990 until 1993, he worked in regional operations at the Sfuzzi restaurant chain, then started his own computer company which he sold to his partner in 1996. From 1996 until 1999, Mr. Walker was a chef at the Barolo Grill, a fine dining restaurant in Denver, Colorado. Mr. Tinter has been our Chief Financial Officer since September 2006. Since 1992, he has been President of Corporate Finance Group, LLC, a consulting firm located in Denver, Colorado. From May 2001 to October 2004, Mr. Tinter was the Chief Financial Officer and, for a period of approximately four months, Chief Executive Officer of Bayview Technology Group, LLC, a manufacturer and distributor of energy saving devices located in Denver, Colorado. ----------Mr. Cooper hos been our Vice President of Operations----Western Division since July 2006. Mr. Maximovich has been our Vice President of Operations - Eastern Division since September 2006. From February 2003 to June 2006, he was Vice President of Operations for Quizno's, a submarine sandwich franchisor headquartered in Denver, Colorado. From January 1999 to January 2003, Mr. Maximovich was Vice President of Operations for Mrs. Fields Famous Brands, Inc., a quick service snack franchisor headquartered in Salt Lake City, Utah. and an Area Manager for SPL from August 2001 to July 2003. Ms. Nau_has_ been our, Director of Marketing since September 2006. From October 2000 to March 2006. she was a Regional Marketing Manager for Culver Franchising Systems. Inc., a fast-casual r_estauranLcbainJp.cated in Prairie du Sac. Wisconsin. Mr. Jones has been a Director since September 2006. Since July 1980, he has been President of and an attorney with Jones and Cannon, P.C., a law firm located in Arlington, Texas. Dr. Reed has been a Director since September 2006. Since 1981, he has been Chairman and Chief Medical Officer of Reed Group Ltd., a workplace absence management business located in Westminster, Colorado. Mr. BonAnno has been a Director since September 2006. He was President and Chief Executive Officer from June 1990 to October 1996 and has been Chairman of the Board of Directors and Chief Executive Officer since October 1996 of Fleet Car-Lease, Inc., a new and used vehicle transport business located in Commerce City, Colorado. In the matter of Marc N. Geman. Administrative Procedure File No. 3-9032. Marc Geman was named as a respondent in an_administrative proceeding number 3 9032., filed by the SEC in June 1996, alleging that Mr. Geman, as CEO of Portfolio Management Consultants, Inc. ("PMC"), failed to obtain "best execution" in connection with the clients' purchase and sale of certain securities. In August 1997, the administrative law judge issued a decision that Mr. Geman, as CEO, failed to file required reports and keep required records, but did not violate the "duty of best execution" rules. A $200,000 fine was imposed and Mr. Geman was barred from participating in the brokerage and investment advisement business for a period of three years. The decision was upheld by the SEC in 2001. Other than this one action, no litigation is required to be disclosed in this Offering Circular. Except as described below in this Item, a non-refundable initial franchise fee of $30^003^000 is payable to us in full when you sign the Franchise Agreement for your SPICY PICKLE Restaurant. If you qualify and choose to purchase more than one franchise, you execute a Development Agreement together with the Franchise Agreement for the first SPICY PICKLE Restaurant to be developed. On execution of the Development Agreement and Franchise Agreement, you pay the $30T00025iOOQ initial franchise fee for the first SPICY PICKLE Restaurant, plus a $10,000 development fee for each additional Restaurant to be developed under the Development Agreement. The total initial franchise fee for the second and each subsequent SPICY PICKLE Restaurant developed under the Development Agreement is discounted to $15,000211000 per Restaurant. We apply the $10,000 development fee paid for the second and subsequent SPICY PICKLE Restaurants to be developed toward the initial franchise fees for each additional Restaurant. The balance of each $4-5^00020,000 discounted initial franchise fee for the second and subsequent Restaurants to be developed under the Development Agreement is due on execution of the Franchise Agreement for that Restaurant, but not later than the date set forth in the Development Agreement which corresponds to the deadline for developing that SPICY PICKLE Restaurant. These fee^jitej^n=r_eXundaMe_un^er_alLcJClinistanc_es. our ''Build-Out ProgramYou must-sign-o-Build-Qut Program-Addendum-at-the-same-fiffle you sign the Franchise-Agreement-You pay-us-a-down payment of $8,500-for-architoctural fees andotherinit-ial costs nt the time you-sign-and del ivcr-to-us-o-letter of intent or similar-term shoot for the space:Before commcncement-of the build out services, you must have-available funds to pay all estimated build-out , costs.If you obtain a binding financing commitment from a third party lending source or you make other arrangements acceptable to us to ensure payment, wo may oleet to aocept on. alternative payment plan for the build-out costs.Build out costs arc based on the costs to develop, construct, equip and decorate- the Restaurant.AH foes and costs paid under the Build Out Program are nonrefundable.See Item 7. Except as described in this Item 5, all franchisees currently acquiring a franchise pay the same franchise fee_and_de.viJflp_me.nLfee per RestaurantdeyeJoRed. GressNet Sales include all revenue from the Restaurant, including sales made away from the Restaurant premises. GfossHst Sales do not include sales taxes and discounts. Royalties are paid by electronic transfer of funds. Contributions will be used primarily for production of advertising and marketing for the Restaurants. See Item 11. Our Restaurants will contribute the same as franchisee-owned Restaurants. We may establish regional advertising co-ops and may reallocate a portion of this fee to regional advertising. The Advertising Contributions are paid by electronic transfer of funds. This local advertising allocation is in addition to the Advertising Contribution, but this is retained by you for advertising your Restaurant. This is the minimum average which must be expended during each calendar quarter, with a report of expenditures submitted to us on or before the 15th day after the end of each calendar quarter. If we establish a regional ad co-op which includes your Restaurant, all or a portion of your local advertising allocation may be reallocated to the co-op. As of the date of this offering circular, there were no established cooperatives. Our Restaurants will contribute on the same basis as franchised Restaurants. Reduced by national Advertising Fund contributions and by local advertising. Payable only if you understate your QrossNej Sales by more than 3%, do not submit reports to us or do not cooperate in performance of the inspection and audit. Payable when the franchise agreement, interest in the Restaurant or the franchise is transferred by you. The transferee is charged no initial franchise fee. Payable if you opt for and qualify for a successor franchise at the end of the initial term. Initial training is included as a part of your initial franchise fee for up to two people, except for those costs paid to other parties. We may require additional training at other times. See itemItejnsJZ_and 11. We charge you for inventory items you purchase through us or our affiliates.These-items-are-c urren^ly-maH^y-feod-iteiBS-maiwfeettire^-freffl-ot^proprietary-reeipes^ MostJnyenlQry_ilems_a rcpu cch asedj hr_Qugh_ th i dors. You have to reimburse us if we are held liable for claims resulting from your operation of your Restaurant. If you do not pay your premiums, although we do not have to, we can pay them for you and you must reimburse us. You reimburse us for our actual out-of-pocket costs and expenses incurred during the build-out of your Restaurant. These are fees which we charge and must be paid to us. We do not refund these fees. Your required expenditures under your lease or commercial center count toward this advertising requirement. Expenses associated with travel, meals and lodging while attending initial training sessions. All of these expenses are payable to third parties. These expenses will vary according to where you stay, where you eat and how far you have to travel. Fees which are not paid-tP_»sJand.aigjiflUfundatllg. - ' '": ,' »ue"
' ."' ■""-r- nftJ L"'! of which is paid at a later date. The initial franchise fee is discounted to $15,0002&fl.Qfl for the second and each subsequent Restaurant that is developed under the Development Agreement. See Item 5.
training__NQne_Qf_the_se_p_avjTieiiis_are__r.e.fun_dabJe-.Qnce_paid. Your_c.Qts_may_hejTigher if you decidfi-to. additional costs will be inc-urrodmay be incurr^gUinles^Jh^laadlQLdj'nsTalls^iLas^a^.omm^njimenit^and amortizes thfi_cflsl_in the common area_mamtenance charge of the lease. We provide you with standardized blueprints for a Restaurant to suit the shape and dimensions of the Franchised Location. This estimate also includes the counter areas for order-taking and food preparation. If you purchase property or a building, or both, for the Restaurant, your additional costs will depend on the location and size of the land and building. We do not typically invest in the land and building for a SPICY PICKLE Restaurant. We are unable to estimate these costs due to the significant variances based on location and market conditions. boards, graphics, wall decor and point of purchase displays. proprietary software if we choose to deve 1 op-proprietary-software-and-make-it-avaliable to you.We reserve the right to charge you for obtaining the software in an amount that will not exceed the high range estimate in the chart above, when added to your other costs incurred for items in this category.See Items 8-MHt-l-I-for-other-informfltion about the required POS System and computer hnrdware-and-software-fof your Restaurant-Note 5: POPT Menus_andJUniforms. This includes the cost of printing menus with the acLdies5_Qf_tb_Er_anchise,dJLQatiQn,_o_ther_goJ r.cJiase_CPJ[lP^)jnaiexials^natiQ_umbre.llas-wjthJhe ,COCA COLA® and Spicy_EijJde^Qgas^anJntmductory grand opening_mar_ketin^campai&n^_iacludinE dii^ct_mailt^iiojjns^ndj^.QthJnfi_fQrJh^taiLand-a,Spicv Pickle Mascot suit (optional! Note 6: Food and Beverages. Paper. furniture, oonsisting of tables, choirs and umbrellas. nml Initial Training?You must open with and maintain an adequate inventory of menu items-awd, ingredients^and paper goods and branded produets-and-merchandise-for-retail-sale-to serve your customers. promotional-and-marketing-eampatgn-and-you will incur costs for giveaways and-direet-marketingrsueh as^ftaHcrs and other promotional and marketing expenses.You will qlsowill incur expenses for retaining and training employees prior to the opening of your Restaurant. Your travel and living expenses when you attend our initial training program in Colorado vary depending on the length of your instruction, the distance you must travel and the standard of living you desire while you attend the program. The estimate covers expenses for two people attending our tbf-eefQur-week training session in Colorado_and certain_Qthe_r_pr_eopeningJrainingjcosts. See Items 6 and 11. Note 8: Security Deposits, Utility l>eftos4t$j-Business Licenses and Legal Fees ("Soft Costs"). Security deposits, if applicable to your Restaurant, are usually one month's rent; utility deposits range from a nominal amount to approximately $1,000; and business licenses range from approximately $100 to $1,000, depending on your location. If you retain an attorney, the legal fee estimate includes entity set-up, lease review, employment matters and advice regarding licenses and permits. SPICY PICKLE Restaurants, combined with use of professional consultants knowledgeable in the restaurant industry and our experience in opening restaurants, when preparing these figures. I3ecaus_e_the ranes_in_the chart are only estimates, it is possible_bQth to reduce and exceed the estimated range of costs Iis.td_iD_eachJlem_Qf the chart. In certain major metropolitan^reas,_actjjal_c.Qsts_may_subs.tantiallv exc_e_e_(Lthe_high atesjnjhe chart. You should review these figures carefully with a business advisor before making any decision to purchase a franchise. We do not offer financing either directly or indirectly for any part of the initial investment. The availability and terms of financing from independent third parties depends on factors such as the availability of financing generally, your creditworthiness, other security and collateral you may have and policies of lenders. Note 11: Multiple SPICY PICKLE Restaurants. Except as mentioned above, including that the initial franchise fee is discounted for the second and subsequent Restaurants (See Note 1), if you sign a Development Agreement, you will incur the costs described in the charts for every SPICY PICKLE Restaurant developed. Your SPICY PICKLE Restaurant must be established and operated in compliance with your Franchise Agreement. It is mandatory that you comply with the standards and specifications contained in an operations manual we provide to you, in the form of one or more manuals, technical bulletins or other written materials ("Operations Manual"), which we may modify. We provide you with our mandatory standards and specifications for almost all of the menu items and retail products and related services offered at or through your SPICY PICKLE Restaurant and for the Franchised Location, equipment, furniture, fixtures, menus, food, paper products, uniforms, supplies, forms, chart of accounts, advertising material, and other items used at your Restaurant. Each of our franchisees are required to participate in our Build-Out Program. Under this program, w_e_ass_isLfranchisees pay us to assist in developing, constructing and equipping their SPICY PICKLE Restaurant in accordance with the terms of the Build-Out Addendum, which is attached to the Franchise Agreement as Exhibit VI. In addition to your payments to ttsthird_parjie_ of the actual cost to develop, construct and equip your SPICY PICKLE Restaurant, you pay us our out-of-pocket costs and expenses and-a-ser-vice fee based-on-the salary e11nnd-time-'Spent-bv-efloh-oI-otHH?mplovees-tot.Q_assist..vtoiu injhe build-out pXyour Restaurant. See Items ___$ and 7. (vi) The lease must contain restrictive use aud,ex.cJus_i.ve_uae_provisions which are acceptable to us. POS Systems, Enterprise System and Intranet. Each of our franchisees must use operations and accounting software that has capabilities that meet our standards and specifications. You must purchase or lease a point-of-sale system and computer equipment meeting our specifications (together with the software, referred to as "POS System")- The POS System currently approved for use in the Restaurants is called Aloha, available through BEC, a Denver, Colorado-based company not affiliated with us. You must also subscribe to._p_a_y_fQj:_. and connect your POS System to the web-based enterprise system provided by Aloha, or such other enterprise system we may designate ("Enterprise System"). Jh i s_ s ys te_m_prqvjdes_fOLgift_car_d^miUiquencv must also subscribe toke_c_Qme_a_mcmber_Q_f the intranet system that we designate. The current supplier of this system is IFX lntcrfflu%na4HneW_eb_ex. The Enterprise System and the intranet have monthly fees that we pay on your behalf out of the Advertising Fund. We reserve the right to require alternate payment arrangements. AVe-reservc the right to develop ond own proprietary software and-lice use tt-to-yourbuHiave-no current plans-to-do so.We reserve the right to derive revenue from POS System maintenance fees, if and when we develop our own proprietary software for use in Restaurants..aIthQUfih_ye_ha.\ie-no current p_lan_s_tQ_do_SQ. See also Items 6, 7 and 11. Purchases from Designated or Approved Sources. the right, upon 30 days prior written notice to you, to require you to purchase from the commissary the Proprietary Recipe Items, bread and other food items. We_are_c_urren11 y_constr.ucjing.a_B.akeryJnJ3e.ny.ei. Colorado that will supply bread to most Restaurants located in Colorado. We also reserve the right, upon 30 days prior written notice to you, to designate a vendor which you must use to provide all bookkeeping, payroll and merchant services for your Restaurant. SPICY PICKLE Restaurants feature sandwiches made with designated premium quality meats, cheeses, pickles and breads available in the market where the franchise will be located. Dietz & Watson is currently the only approved brand of meats and cheeses for the sandwiches. We designate exclusive suppliers for these items based on the market where your Restaurant is located. Most ether-markets in the United States have a designated source for Dietz & Watson meats and cheeses.W-e-appfove the source of breads for the sandwiches bused on our review and quality testing of local bakeries' products. We reserve the right to designate alternative sources of meats, cheeses, pickles, breads and certain other products of a quality comparable to these brands that you must use in connection with supplying your Restaurant. You will purchase or lease the rest of your inventory needs, equipment, supplies, and services used, sold or leased through your SPICY PICKLE Restaurant only from suppliers designated or approved by us in advance. YeuWe reserve the right-to de_sjgqate a_s_insJe_approved supplierjbr cextainJnye_ntory ilms,^quinmentt_suppjies-and_services. If there is no designated, or apnrjiYd_sunplkr,fQr_a_partiQuJaj item ..you must only purchase, lease, sell or use inventory, equipment, supplies and services meeting our standards and specifications. On or before your commencement of our initial training program, we will make available to you a list of our approved suppliers, and.the standards and specifications for items to be used, sold or leased by you through your SPICY PICKLE Restaurant, as well-as-our-criteria for approving a-supplier. your purchases from designated or approved sources, or according to our standards and specifications, may range from 83% to 95% of the total cost of establishing a SPICY PICKLE Restaurant and approximately 30% to 40% of the total cost of operating a SPICY PICKLE Restaurant after that time. used, offered for sale or leased by franchisees upon 30 days written notice to all franchisees and all approved suppliers. We do not provide material benefits, such as renewal or granting additional franchises to franchisees, based on your use of designated or approved sources or suppliers. All marketing and promotion of your SPICY PICKLE Restaurant must conform to our standards and specifications. You must submit to us samples of all advertising and promotional materialsthat have not been prepared or previously approved by us. Your Restaurant must participate in promotions we institute from time to time for all SPICY PICKLE Restaurants, or for all SPICY PICKLE Restaurants within a particular area. We retain the right to develop and control all advertising using our Marks on the Internet_Ojr_QilLe_r_eJectronic method. We reserve the right, upon 30 days prior written notice to you, to require that you participate in electronic advertising by creating, customizing or providing access to a linked web page or otherwise. All SPICY PICKLE Restaurants, including our Restaurant, must participate in this program and in other promotions we may adopt. You must maintain certain types and amounts of insurance coverage described in the Franchise A gr eejoienj J3pe r at ions ManuaLaadJheJease,for the pcemis.es__yyhere your Spicv_Pi.Qkle_Re_staurant_wjlLbe located. If you fail to purchase this insurance, we may demand that you cease operations or obtain insurance for you and you must reimburse us for the cost of the insurance. All insurance policies must name us as an additional insured and give us at least 30 days prior written notice of termination, amendment or cancellation. You also must provide us with certificates of insurance evidencing your insurance coverage before the opening of your SPICY PICKLE Restaurant. You must furnish us with copies of all required insurance policies or other evidence of insurance coverage and payment of premiums as we request from time to time. We reserve the right, upon 60 days prior written notice to , you, to require you to change the type of insurance you are required to maintain and to revise the required coverage limits. may, in our discretion, either retain all or a portion of the credit of any volume discounts, rebates or incentives received as a result of your purchases or contribute all or a portion of them to the Advertising Fund. THIS TABLE LISTS YOUR PRINCIPAL OBLIGATIONS UNDER THE FRANCHISE AGREEMENT AND, IF APPLICABLE, THE DEVELOPMENT AGREEMENT. IT WILL HELP YOU FIND MORE DETAILED INFORMATION ABOUT YOUR OBLIGATIONS IN THESE AGREEMENTS AND IN OTHER ITEMS OF THIS OFFERING CIRCULAR.